Two Russian Cosmonauts stepped outside the International Space Station (ISS) on Wednesday to perform a spacewalk on the Russian Segment (RS) of the orbital outpost. The spacewalk – which was expected to last around six hours, but was completed in under five hours – comes amid a busy time on the ISS, with the ATV-2 launch, HTV-2 relocation, and Progress M-07M/39P undocking all scheduled before the end of this week. The spacewalk began just 15 minutes later than scheduled at 1:30 PM GMT (8:30 AM EST), when spacewalkers Dimitri Kondratyev and Oleg Skripochka opened the hatch of the “Pirs” Docking Compatment-1 (DC-1), marking the beginning of the EVA. Kondratyev was EV-1, wearing the red-striped Orlan-MK spacesuit, and Skripochka was EV-2, wearing the blue striped Orlan-MK suit. Both Orlan-MKs are outfitted with helmet light and cameras from US Extravehicular Mobility Unit (EMU) spacesuits. This was the second EVA for Kondratyev, and the third for Skripochka. The pair also made a spacewalk together last month – Russian EVA-27 on 21st January. The main purpose of the EVA was to install two new scientific experiments outside the “Zvezda” Service Module (SM). The first experiment, RK-21-8 SVCh-Radiometria, was installed on the URM-D portable multipurpose workstation on Plane II (Port side) of the SM Work Compartment (RO) Large Diameter (LD) section. Radiometria will collect data that will be used in seismic forecasts and earthquake predictions. 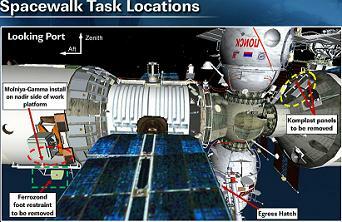 The two spacewalkers also removed two Komplast panels (numbers #2 and #10) from the “Zarya” Functional Cargo Block (FGB). The two panels contain materials that have been exposed to the vacuum of space, in order to research materials that may be used for the design of future spacecraft. The two panels were brought back inside the ISS for analysis. The final task for Kondratyev and Skripochka was to remove the Yakor (Ferrozond) foot restraint from the SM RO LD. Yakor was then jettisoned overboard. Two items, some Multi Layer Insulation (MLI) and an unneeded cover, were also brought back inside the ISS. During egress, ingress, and three times during the EVA, there were periods of orbital darkness. During these periods, the EV crew were told not to perform any tasks, as that time is reserved as “catch-up time” in case the crew falls behind on their timeline. In the end, the spacewalk ended well ahead of schedule, with the hatch closed at 18:21 GMT for an EVA duration of 4 hours and 51 minutes. The previously scheduled task of deploying the “Kedr” microsatellite had already been cancelled, due to the fact that, if it were deployed EVA-28, Kedr’s batteries would run out before the 50th Anniversary of Yuri Gagarin’s spaceflight, which the satellite is designed to commemorate. 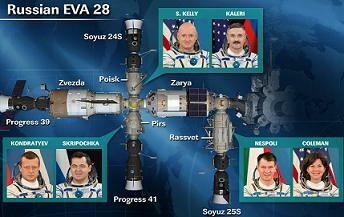 Instead, the satellite will be switched on inside the ISS on 12th April. During the EVA, Station Commander Scott Kelly and Flight Engineer-1 (FE-1) Alexander Kaleri were “locked out” inside the “Poisk” Mini Research Module-2 (MRM-2) and docked Soyuz TMA-01M/24S spacecraft. FE-5 Paolo Nespoli and FE-6 Cady Coleman did have access to every part of the station, including their Soyuz TMA-20/25S spacecraft, that is forward of the SM. This was to ensure that all crewmembers have access to a Soyuz in the event of an emergency, as the SM Transfer Compartment (PkhO) hatches need to remain closed for the duration of the EVA, in case the PkhO needs to be depressurised in the event that the primary airlock (DC-1) cannot be repressurised. Having the PkhO hatches closed prevents transit between MRM-2 with docked 24S, the SM, and the rest of the station. The hatches between Progress M-09M/41P, docked at DC-1 Nadir, were closed this week so that DC-1 can be depressurised without needing to depressurise 41P. This also enables 41P to undock in the event that DC-1 cannot be repressurised. The hatches will be re-opened and 41P re-integrated with the ISS following the EVA. The hatches between Progress M-07M/39P, docked at SM Aft, were also closed this week, in order to allow 39P to undock from SM Aft in the event that the SM is cut off from the rest of the station via a stuck hatch on the SM PkhO. 39P is scheduled to undock on Sunday 20th February in order to clear the SM Aft port for ATV-2, and so the hatches will not be re-opened following the EVA.